Der Artikel Passive and Active Measurement wurde in den Warenkorb gelegt. Ihr Warenkorb enthält nun 1 Artikel im Wert von EUR 72,27. 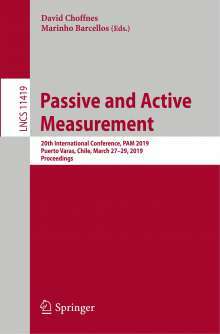 This book constitutes the proceedings of the 20th International Conference on Passive and Active Measurement, PAM 2019, held in Puerto Varas, Chile, in March 2019. The 20 full papers presented were carefully reviewed and selected from 75 submissions. The papers cover a wide range of important networking measurement and analysis topics from low layers of the network stack up to applications, using measurements at scales large and small, and covering important aspects of the network ecosystem such as routing, DNS, privacy, security, and performance. They are organized in the following topical sections: mobile networks; measurement at Internet scale; measuremen at other scales; domain names; failures; security and privacy; and Web.